Teacher Krissy finished her undergraduate studies in Ateneo de Manila University, Manila, Philippines in 2001. She discovered her love for teaching in 2004 and since then has taught children in different levels: preschool, primary, and intermediate. While teaching children full-time and raising a family, she nevertheless completed her Master's Degree in Counseling Psychology (with a focus on education) at the Ateneo de Manila University and, in 2010, successfully hurdled the Professional Regulatory Commission (PRC) Licensure Exam for Teachers (LET). She started her yoga practice in 2006 and came to believe that yoga is beneficial to children to help them become more self-aware, focused, and confident learners. To pursue this vision further, she took a certification course under Grace Hetherington and became a KidzYoga teacher (KYT). She also completed 200 hours of teacher training course on yoga philosophy, meditation, yoga therapy, kriyas, pranayama, and asanas (under Jovan Nikolic and other multi styles under Chetan Mahesh). She has also recently taken the Reiki Level 1 training under the mastership of Celine Cervi. She also holds current emergency first aid training and Level B CPR certificates from St. John's Ambulance in Vancouver. 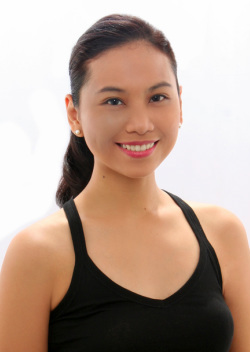 Krissy also teaches adult yoga classes in Yoga Philippines and Beyond Yoga in Westgate Alabang. Teacher Krissy on Kids One Yoga classes: "I craft my lesson plans with age appropriate themes and objectives and integrate these with breathing exercises, yoga poses, guided visualizations and meditations, counseling techniques, art activities, lessons, stories, music, and games to give the children the most enriching, happy, and empowering experience in class." She is wife to Jomi and a mom to three yoga kids: Juliana, 12; Matti, 6; and Jamie, 4. She loves singing Broadway songs, OPM, and ballads. She enjoys dancing, reading books, doing arts and crafts, traveling, and learning about World History and Psychology. Krissy has an AMI (Association Montessori Internationale) Primary Diploma from the Montessori Training Centre of British Columbia in Canada. She also holds an Early Childhood Education Certificate given by the Ministry of Education of British Columbia. She is currently working as a Montessori Primary guide - applying the approach of Dr. Maria Montessori on child development. Her children enjoy the peace breath during big group. It was “Love at first Savasana” for Kathea Koren De Guzman or simply known as “Nikoy” after her first-ever Bikram yoga class. Her passion for yoga stems from her love of movement and the performing arts. She was first introduced to the art of ballet at the age of six. After a few years into ballet, she then experimented with gymnastics. The curiosity bug bit her once again in July of 2008 and led her to try out Bikram yoga. By this time she was already a young breast cancer survivor who was juggling motherhood and being Managing Director of several family-owned food franchises. As a breast cancer survivor, she extensively read and researched on the benefits brought about by yoga in preventing the occurrence and re-occurrence of cancer, hence her decision to try it out for herself. Considering her extensive ballet and gymnastics background, she had no difficulty switching to the yoga discipline. Nikoy took up Yoga for Breast Cancer Recovery and Beyond under Camille Kittrell of ExclusiveYoga as well as a Bikram Yoga Teacher Training Course in Los Angeles, California. She is also a certified KidzYoga Teacher under Grace Hetherington's tutelage. Nikoy refers to yoga as her calm after the storm, considering the hectic lifestyle that she leads as a single mom, business woman, dancer and make-up artist. She finds her balance in her practice of yoga. I first discovered yoga in 2010 at a gym. I've always led an active lifestyle. My family have history of cardio vascular disease and diabetes. I decided to try out yoga only as part of my fitness regimen. Also, year 2010 I went through a tough period in my life. I was looking for something healing and healthy in my life. I felt intense draw towards yoga. It made me even more stronger physically and emotionally. The yoga mat was my refuge where I can just ‘be’ in the moment, relax and fully let go. I love the positive energy that yoga brings. It helped me become a happier person and live a healthier life. As time went on, I started to notice the transformations in my mind and changes in my world view. Then, I wanted to deepen my practice and share this gift with others, so I joined an amazing kids yoga teacher training with Grace Hetherington for Kidz Yoga. Why kids yoga? I love being with kids. They are the most enlightened and most natural beings. I think about all the good things my practice has done for me and imagine if it has been introduced to me 5 or 10 years ago. How would my life have been different and how could it helped me through my childhood or my adolescent years or teenage years. Children are now faced with so much stress, anxiety and lack of focus at a younger age. I want to share the gift of yoga to children. Start them young. I work in a banking industry full time, but I'am lucky enough to be able to teach kids yoga. I take time off to go on retreats, take additional training, workshops and continue to live in the corporate world and the yogi world simultaneously.